Purchasing a luxury brand watch is a big investment and one you don’t want to take lightly. Some luxury watch shoppers know exactly what type of timepiece they are in the market for, whereas others may be looking at a wide array of exceptional brand watches until they find the perfect one which catches their eye. If you’re a Willow Grove, Warminster or Newtown watch shopper, and considering a few different watch brands and watch models, one particular watch to consider is the Breitling Chronomat 41 two-tone watch. Once your interest is piqued, this lovely timepiece is yours to purchase at Precision Watches & Jewelry in the Willow Grove Park Mall. The Breitling watch manufacturer is one with an impressive history. Founded in Switzerland in 1884 by Leon Breitling, the Breitling watch brand started producing pocket watches, with a focus on chronographs, which were high in demand at that time. In 1889, Leon received a patent for his simplified model, which exhibited a sleek design and straightforward manufacturing process. In 1914, when Leon passed away, his son Gaston took over the company and continued with his legacy. Gaston was known to have the same innovation and talent as his father and produced unique watches during that time. The business moved from generation to generation, with the Breitling lineage upholding the standards and quality of the Breitling watch brand. In 1979, the Breitling watch brand left the Breitling family and was acquired by the knowledgeable entrepreneur Ernest Schneider, who was also a watchmaker. The Schneider family, under new ownership, had a hand in running the Breitling watch company from that point forward until 2017. At this point, it was acquired by the CVC Capital Partners with CEO Georges Kern, an established individual in the watch industry, taking over the lead and hoping to carry on the wonderful tradition associated with the Breitling name. Through the years, Breitling watches have been extremely popular with the watch-wearing public in Switzerland, Sweden and the Netherlands, and this popularity continues to grow at a rapid pace. As you can see with the rich history highlighted above, those who had the Breitling watch production in their hands treated the company and products with detailed insight and dedication, producing watches which were painstakingly designed and carefully crafted every step of the way. These standards, which were so important to the Breitling family back in the 19th century and onward, remain of great importance today with the current manufacturer. When you purchase a Breitling watch, you are investing in an exquisite timepiece, where each aspect is carefully orchestrated and constructed. If you find yourself seeking out the perfect watch to buy and live in Willow Grove, Warminster, Newtown or another nearby locale, Precision Watches & Jewelry is the luxury watch retailer to visit and the Breitling Chronomat 41 two-tone watch is the luxury watch to seriously consider purchasing. 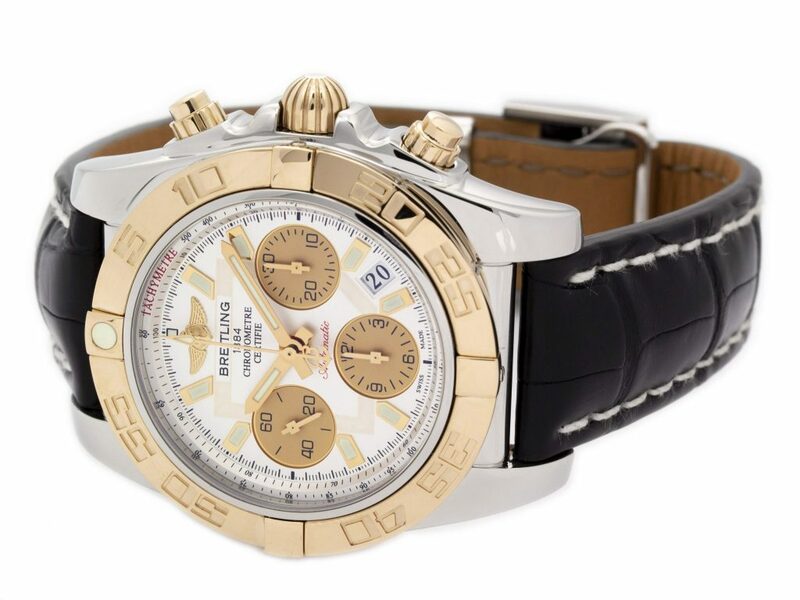 The Breitling Chronomat 41 two-tone watch satisfies all of your timekeeping needs and much more with wonderful features such as complementary stainless steel and 18-karat gold materials, sapphire scratch-resistant crystal, luminescent 18-karat rose gold toned hands, silver dial markers with three gold sub-dials, date, chronograph and water-resistant capabilities up to 300 meters/1,000 feet. 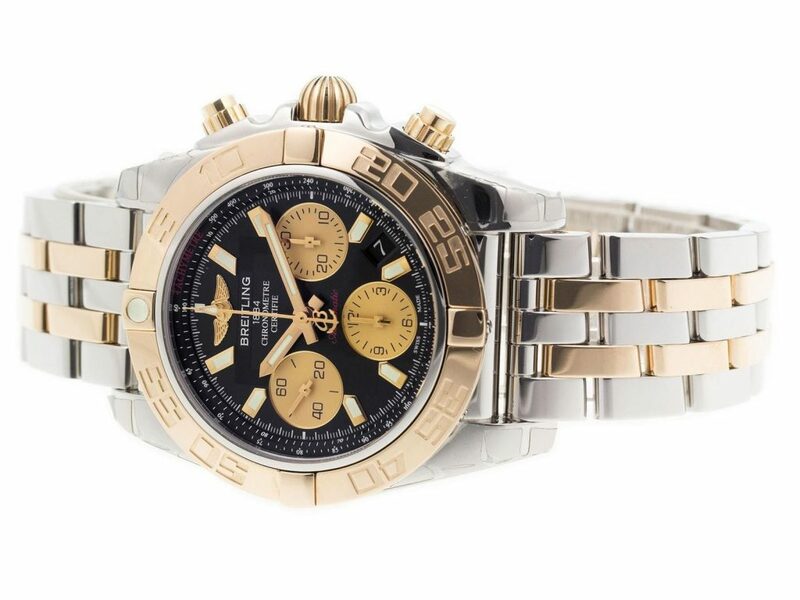 When you purchase the Breitling Chronomat 41 two-tone watch from Precision Watches & Jewelry in Willow Grove Park Mall, you’ll be adding a sensational timekeeping accessory to your collection, sure to suit your wardrobe perfectly and be the topic of conversation amongst your friends and other watch enthusiasts.